The drama of John Adams and Thomas Jefferson is the foundational story of Americacourage, loyalty, hope, fanaticism, greatness, failure, forgiveness, love. 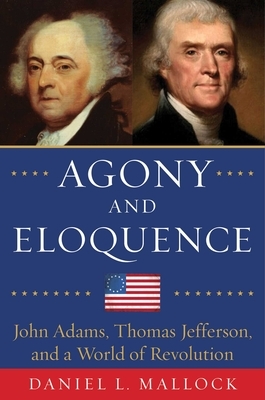 Agony and Eloquence is the story of the greatest friendship in American history and the revolutionary times in which it was made, ruined, and finally renewed. In the wake of Washington’s retirement, longtime friends Thomas Jefferson and John Adams came to represent the opposing political forces struggling to shape America’s future. Adams’s victory in the presidential election of 1796 brought Jefferson into his administrationbut as an unlikely and deeply conflicted vice president. The bloody Republican revolution in France finally brought their political differences to a bitter pitch. In Mallock’s take on this fascinating period, French foreign policy and revolutionary developmentsfrom the fall of the Bastille to the fall of the Jacobins and the rise of Napoleonform a disturbing and illuminating counterpoint to events, controversies, individuals, and relationships in Philadelphia and Washington. Many important and fascinating people appear in the book, including Thomas Paine, Camille Desmoulins, Dr. Benjamin Rush, Tobias Lear, Talleyrand, Robespierre, Danton, Saint-Just, Abigail Adams, Lafayette, James Madison, John Quincy Adams, Dr. Joseph Priestley, Samuel Adams, Philip Mazzei, John Marshall, Alexander Hamilton, and Edward Coles. They are brought to life by Mallock’s insightful analysis and clear and lively writing. Agony and Eloquence is a thoroughly researched and tautly written modern history. When the most important thing is at stake, almost anything can be justified. Daniel L. Mallock grew up within walking distance of Peacefield, the home of John and Abigail Adams. Daniel was a member of the Civil War Round Table of Greater Boston, and the Quincy Historical Society. He attended Ripon College and Brandeis University and has published articles in North and South. He lives in Nashville, Tennessee, with his family and several cats.